Above is an infographic on the presence of US military in the country during the last decade since it launched its so-called war on terrorism. The United States (US) recently declared a foreign policy pivot toward Asia involving greater economic, political and military engagement in the region. The shift however started as early as 2001 when its Quadrennial Defense Review proclaimed a shift to Asia and a corresponding increase in the US military presence through fixed bases, rotational deployments, training exercises and logistical arrangements. The US called the Philippines its “second front [in the war on terrorism]” in January 2002 and has dramatically built up a nationwide military presence since then. The US military has made extensive use of the Visiting Forces Agreement (VFA) to station some 600-700 special forces troops in the country and to bring in as much as 7,000 other soldiers at a time on so-called joint exercises, civil-military actions and relief operations. It has also used the Mutual Logistics and Support Agreement (MLSA) to establish military outposts and access war materiel for its forces. 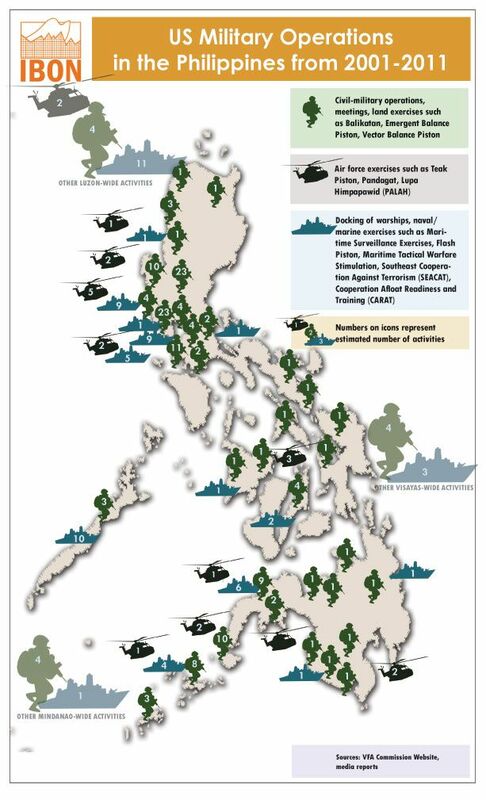 The whole archipelago has been transformed into a US military base, which violates Philippine sovereignty and the 1987 Constitution.